Been a while since the metal news! Here is a TON for you. Enjoy! CALIFORNIA – California death metal pioneer, Autopsy, will re-release its all-time classic slab of brutality, Mental Funeral, on October 17th via Peaceville Records. The special 20th anniversary edition of Mental Funeral will be released as a CD/DVD package with a bonus DVD containing two previously unseen shows from Rotterdam 1990 and San Pedro, California in 1991, as well as new extensive liner notes written by the band and a track-by-track breakdown. Autopsy is currently gearing up to enter Fantasy Studios in Berkeley, CA later this month to record a few new tracks for an upcoming collection entitled, All Tomorrow’s Funerals. The monstrous, 21-track release will contain remastered versions of all of Autopsy’s EPs – everything from ‘Retribution For The Dead’ to the now sold out ‘The Tomb Within’ – as well as the new cuts. All Tomorrow’s Funerals will be presented on CD and vinyl with all original artworks, liner notes from the band and a killer new cover from Matt Cavotta. The release date for All Tomorrow’s Funerals is tentatively set for March of 2012 on Peaceville Records. As ABSU’s latest evolutionary output — their sixth full-length, Abzu — nears North American release this Tuesday, October 11th via Candlelight Records, advance reviews from print and online media worldwide are praising the brilliant, blazing textures the opus bears. As with every album in the Texas-based outfit’s lineage, Abzu takes ABSU‘s occult blackthrash mythology to new calculating, dark new territories through a whirlwind of razor-sharp riffage and Proscriptor’s signature scathing cackle and some of the most top-notch drumming in extreme metal. Today, Decibel Magazine is helping us bring the wrath of Abzu to the masses as we await its pending release, by streaming the entire album. LISTEN HERE! Abzu,is the second part of an ongoing trilogy of albums, which began with 2009’s acclaimed Absu, and will eventually come to a finale with Apsu. Recorded at Nomad Recording Studios in Carrollton, Texas, Abzu finds drummer/vocalist Proscriptor and bassist/vocalist Ezezu sharing equal vocal duties and debuts the skills of new guitarist Vis Crom. The record was mixed by J.T. Longoria (King Diamond/Solitude Aeternus), and features original cover art from Polish artist Zbigniew Bielak (Watain, Behemoth, Destroyer 666, Vader). 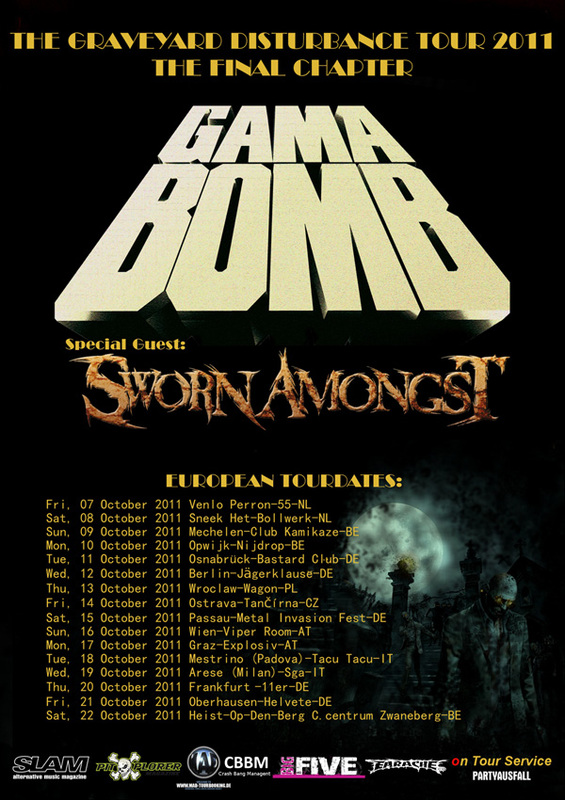 Irish thrashers GAMA BOMB are due to kick off a headlining European tour tomorrow, Friday, October 7th, in Venlo in the Netherlands. Having just completed a UK tour supporting British thrash legends ONSLAUGHT, GAMA BOMB are now preparing to lead the charge into Europe for the two week headlining trek, with support from British thrashers SWORN AMONGST. 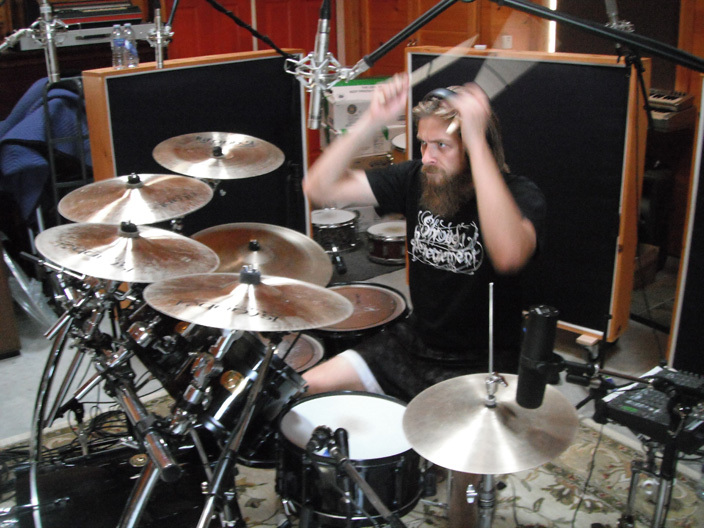 Canadian blackened doom metallers WOODS OF YPRES have recently finished recording their forthcoming new album, WOODS 5: GREY SKIES & ELECTRIC LIGHT at Beach Road Studios in Ontario, Canada, with producer SIEGFRIED MEIER. “W4: ‘The Green Album’ was the first true WOODS OF YPRES album, the three before it were prequels, W5: ‘Grey Skies & Electric Light’ is the sequel and Woods 4.5: ‘You Were the Light’ was the preview before the sequel. However, unlike the movies, this W5 sequel is the best one yet! Drawing inspiration and influence from some of our favourite albums, the best of the WOODS OF YPRES sound was created, selected, refined and perfected into our best self-contained, stand-alone songs to date, while still maintaining the flow of an ongoing concept as a WoY album should, however, with less art, less expressionism and more of what you want when you want it. “W5 is a tighter, more effective WOODS OF YPRES for a broader audience of listeners young and old, new and loyal. A satisfying ‘press play and drive’ kind of album drawing the best from old Woods, current Woods and the Woods yet to come on what will be a milestone album, our sixth in less than 10 years and nearing the 10th anniversary of the founding of the band. We’ve never sounded better and we’d never been fully satisfied with any recording, until now. Shot in one of Melbourne’s hottest burlesque bars, Red Bennies, Hatchet Dawn’s new music video for the first single ‘Dark Symmetry’ brings the sound and image of the band’s debut album Rebirth into a visual and sonic medium. The ‘Dark Symmetry’ video was directed and edited by Gareth McGilvray from McG VideoCore who has directed over 70 videos in his time and features burlesque performer, Miss Nic, one mad Mustang and many of Hatchet Dawn’s supportive friends and fans. If you have a craving for the weird and twisted, you will want to see this video. IDES OF GEMINI is a collusion of musical forces precipitated by the haunting and inimitable vocal prowess of singer/bassist Sera Timms, also of Los Angeles dark-psych alchemists Black Math Horseman. The compositions are the long-simmering mental fallout of veteran music and film journalist J. Bennett (guitar/backing vocals), who has spent most of the last 13 years writing for such publications as Decibel, Terrorizer, Revolver, Alternative Press and Thrasher. The third and final corner of the triangle is Kelly Johnston, whose martial drumming techniques and soaring backing vocals literally brought IDES OF GEMINI to life as a performing entity. Last year, Timms and Bennett recorded and self-released IDES OF GEMINI’s four-song EP, The Disruption Writ, which was anointed “My Favorite Demo of 2010” by the highly influential music blog Invisible Oranges. Lyrically, the songs detailed the terrifying permanence of dismemberment in all its unsettling forms: psychological, emotional and physical. Musically, though? Someone on the Internet called it “dream doom.” Nobody likes to be pigeonholed, but IDES OF GEMINI will gladly take up temporary residence in that particular nook for the sake of shorthand. Which is to say that “dream doom” will do the trick for now. And now is nothing if not fleeting. Mostly because IDES OF GEMINI are about to record their full-length debut, set for release via Neurot in the Spring of 2012. “We’re not religious people, but getting the nod from Steve Von Till and Scott Kelly is like getting onstage only to find Moses and John The Baptist in the front row, wearing your band’s t-shirts,” Bennett enthuses. “And we don’t even have shirts yet, which makes it all the more incredible. The point, though, is this: The impact Neurosis has had on our psyches over the years is immeasurable. ‘Honored’ doesn’t quite cover it. But before anyone gets too excited, I should also probably mention that we sound nothing like Neurosis. IDES OF GEMINI will make their Northern California debut at the Oakland Metropolitan Operahouse on October 15th as part of the Blood, Sweat + Vinyl Music & Film Festival alongside Bay Area greats Oxbow and Evangelista. The night will also mark the DVD release of filmmaker Kenneth Thomas’ new documentary, Blood, Sweat & Vinyl: DIY in the 21st Century, which highlights the music and inner workings of three of the finest independent labels currently in operation: Hydra Head, Constellation, and—you guessed it—Neurot. Brazilian death metallers GRAVE DESECRATOR have officially joined the Pulverised Records extreme metal family! Formed in 1998 and backed by two full-length albums and a string of EPs, GRAVE DESECRATOR remains one of the few remaining Brazilian acts true to its untamed and barbaric form of death metal darkness. All Guts, No Glory marks EXHUMED’s first new record in almost eight years and offers up 11 choice cuts of grinding death metal combined the raw ferocity of their legendary Slaughtercult album with the wild ambition of 2003’s Anatomy Is Destiny. As crimson concertos such as “Dis-assembly Line,” “As Hammer To Anvil,” and “Funereality” illustrate, All Guts, No Glory is EXHUMED’s finest moment to date. Check out “I Rot Within” HERE.